We are excited to announce the addition of Metalyfe to the DigitalBits partnership ecosystem. Metalyfe is a blockchain browser that allows users to regain control of their personal data generated via online activities. The current state of the internet sees large technology companies such as Amazon, Google and Facebook collecting and profiting from valuable user data, without compensation to the billions of people generating this information. Utilizing Lyfecoin technology, Metalyfe creates an ecosystem in which users are protected, and given the opportunity to monetize information that up until now, technology behemoths have been amalgamating free of charge. Metalyfe, a full web 3.0 enabled browser, aims to be the go-to access layer for dApps, and a portal for housing and monetizing data that current browsers collect on behalf of third parties. The first decentralized web 3.0 portal focuses on providing users with a modern, safe, and secure method to navigate the digital world, access dApps, and leverage the ownership of their personal data. In an industry full of ideas and minimal execution, Metalyfe brings product to the table. Metalyfe has implementation-ready applications across Mac, Windows and Linux, an App Store, and a mobile app. Users benefit from encrypted browser history, a built-in multi-currency wallet, and are able access dApps through the browser. The native token of the Metalyfe blockchain is Lyfe Coin. 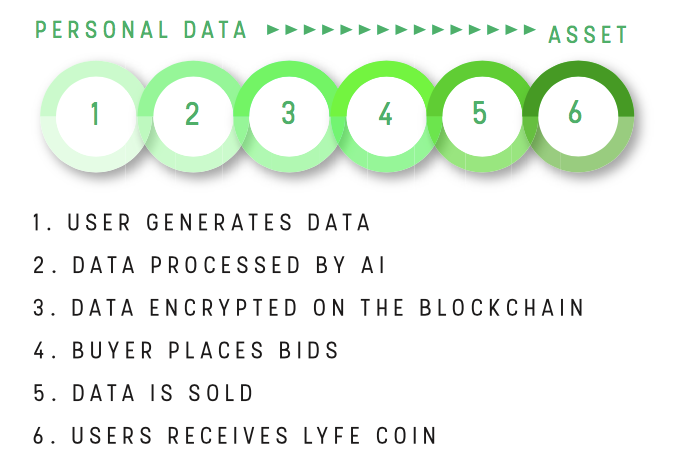 The primary use case of Lyfe Coin is to allow generators and purchasers of data to transact, compensating users for their data. Additionally, Lyfe Coin brings value to both digital and physical assets that reside within the Metalyfe ecosystem. DigitalBits will serve as one of the primary use-cases of the Metalyfe data marketplace. Utilizing Metalyfe’s multi-currency wallet, users will be able to spend tokenized assets on the DigitalBits blockchain towards online purchases in a one-click pay system. With DigitalBits targeting the Loyalty & Rewards sector as its first use-case, this will allow users increased flexibility to spend their points. Today consumers face a myriad of issues when it comes to using their points, from siloed programs that do not allow transfer of value, to changing rules and program requirements. These frustrations have led to in excess of $16 billion worth in points going unused annually in the United States alone. The collaboration between these two projects looks to lift limitations currently set on consumers, allowing for a wide variety of tokenized assets to be spent through a dynamic decentralized browser. Central to the DigitalBits philosophy is a mission to drive mass adoption through the integration of existing consumer applications. This appears simple enough, but it is a mission that goes hand in hand with the future of blockchain technology. DigitalBits took this approach because it makes blockchain inclusive and available to everyone, allowing society as a whole to benefit from revolutionary technology. The industry that stands before us right now is complex, and even those actively involved run into issues. In order to change the world, blockchain needs to be accessible and usable by all. Metalyfe shares this point of view, establishing themselves as a transition from web 2.0 to web 3.0. The Metalyfe Blockchain Browser was created with the user in mind, combining popular aspects from current browsers with blockchain and dynamic innovations like board technology. Like DigitalBits, Metalyfe purports the idea of adapting and complimenting learned consumer behaviour, and the creation of a user-centric experience. With a shared focus on enabling the user, DigitalBits is excited for the possibilities that the Metalyfe partnership brings. This is another step taken in our mission to bring blockchain to the masses.